Whether it is sun washed, stained and tattered, or crisp, pristine and framed, this table adorns labs and classrooms the world over. Some have spent hours on end memorizing all the names, whereas others barely made it past helium. Whatever your relationship with science you will have seen a periodic table. It’s the international iconic flag that when hung on a wall says “scientists work here” in less than a second. In a world of fast-paced advancement we are constantly excited by the next big discovery. Whether it’s an industrial innovation or a therapeutic breakthrough we all praise and credit the end benefit. However, do you ever stop and wonder about those that helped share the knowledge needed? One could argue that those who categorize and communicate knowledge are just as important to discovery as those who apply it. Without the tools to categorize, communicate and share, we would not have all we see around us in the world today. So, to honour one of the communication greats, we have created our own version to salute this iconic chart. On it you will see the ordered elements that make up particle characterization solutions. Can you spot any trends? Are there elements missing? Are there new elements to be discovered? We hope this chart helps you find your way to your next big discovery. 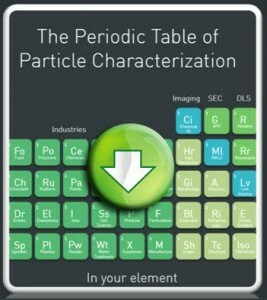 Click here, or on the image below, to explore Malvern’s Periodic Table of Particle Characterization.